Snow White and Rose Red. No end in sight for 10-inch netbooks. These diminutive machines with weak single-core processors still enjoy great popularity. 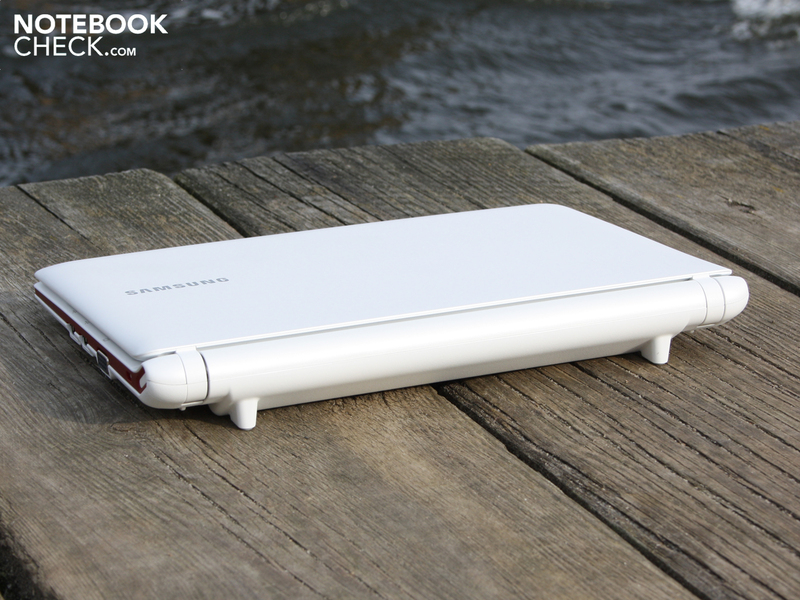 This is reason enough for us to take a closer look at the Samsung N145, which can be yours for as little as €235. 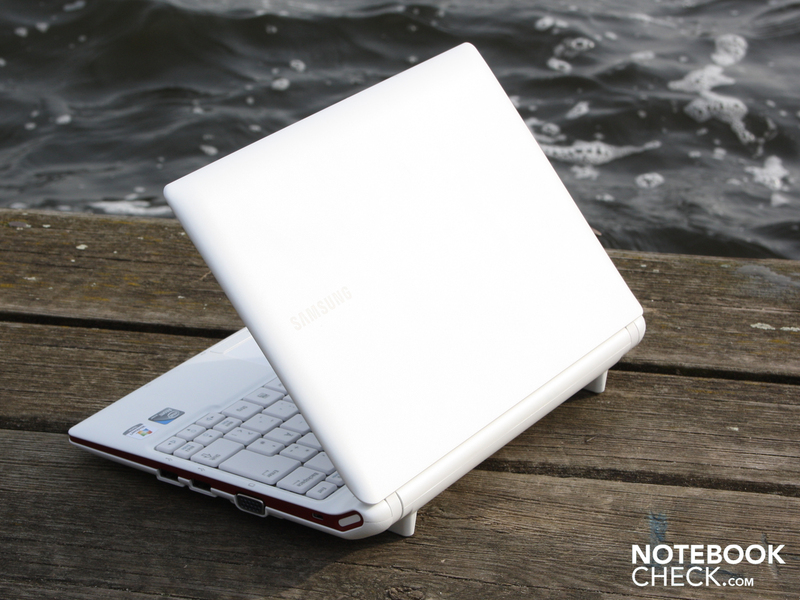 Samsung NP-N145-JP02DE: A stylish, portable midget for a low price? 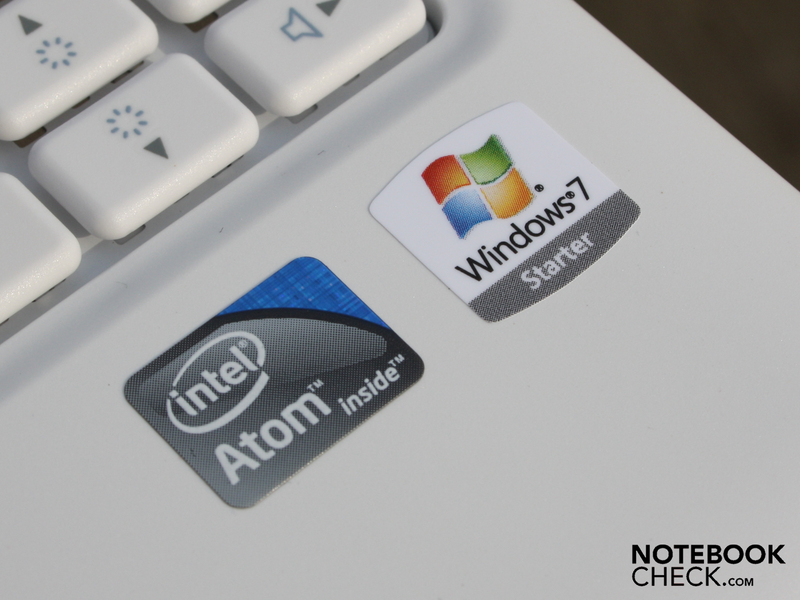 The last 10-inch netbooks we reviewed were without exception dual-core Atom systems. 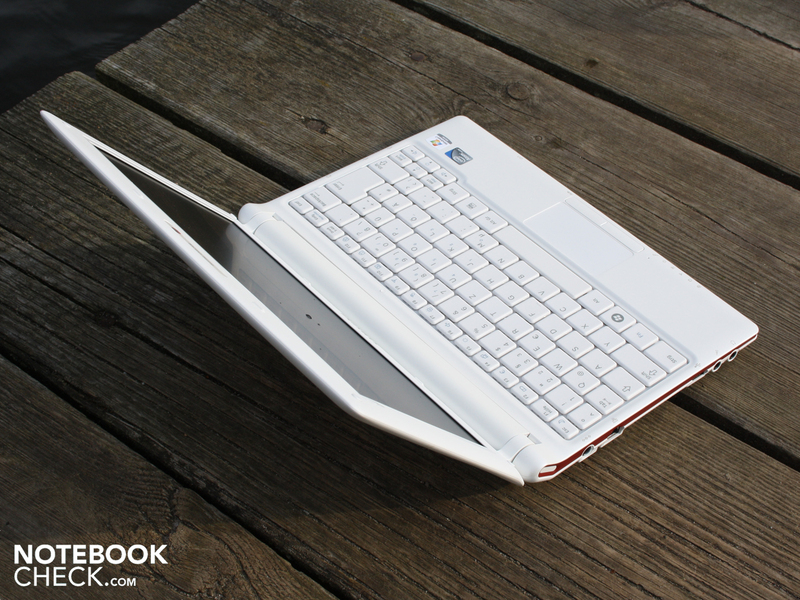 The N550 and D525 processors have been able to give palpably more speed to small netbook systems for the first time. However, we don’t want to lose sight of the fact that there is still an enormous number of single-core Atoms being sold. The reason for this is the low price-tag, sometimes as low as €199. 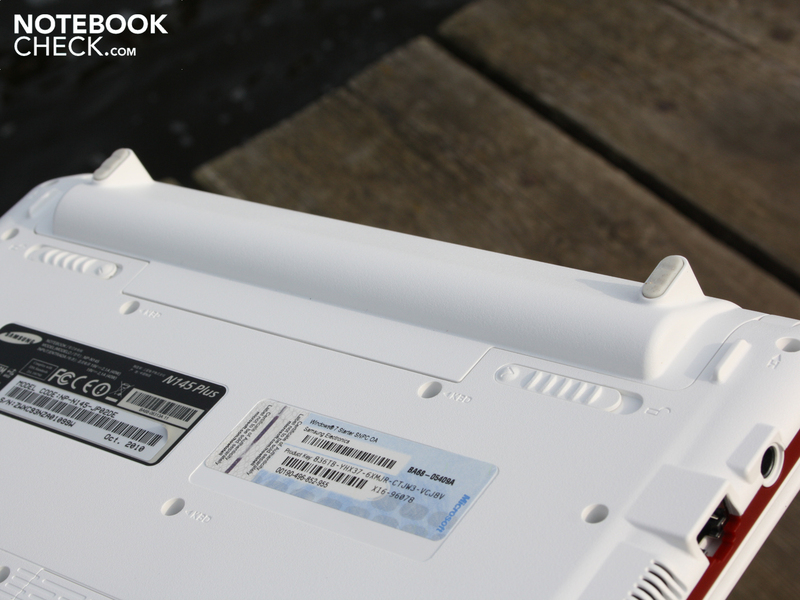 The price of the Samsung N145-JP02DE that we have before us was not quite as low as that recently offered by an e-tailer for the Lenovo IdeaPad S10-3; this white dwarf will set you back €235. But that is still an attractive price, as long as it can offer good battery life, reasonable input devices and the ability to be used outdoors. 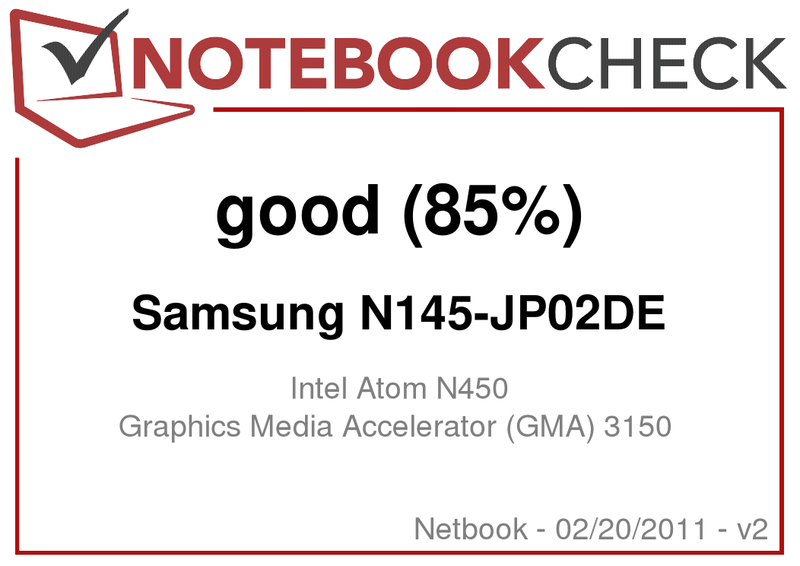 Can the N145, like other Samsung netbooks in the past, hold its own with exceptionally low levels of unwanted heat and noise? How does the matt screen cope with the sunlight, is it bright enough? 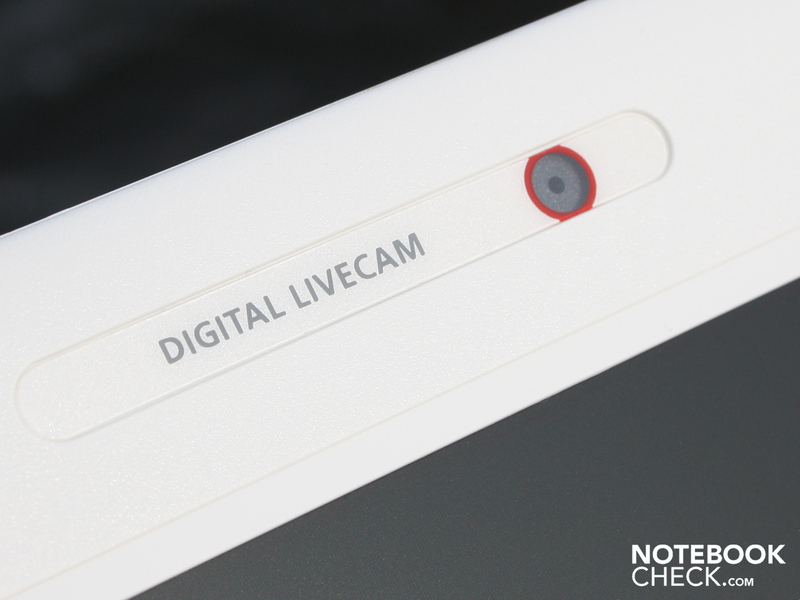 The white case with red edging looks pretty, but is it a good choice for everyday use? Find all the answers in our review. Battery sticks out but is firmly attached. The matt plastic look is susceptible to dirt. The N145’s look is simple but still eye-catching thanks to its pearly white colour. 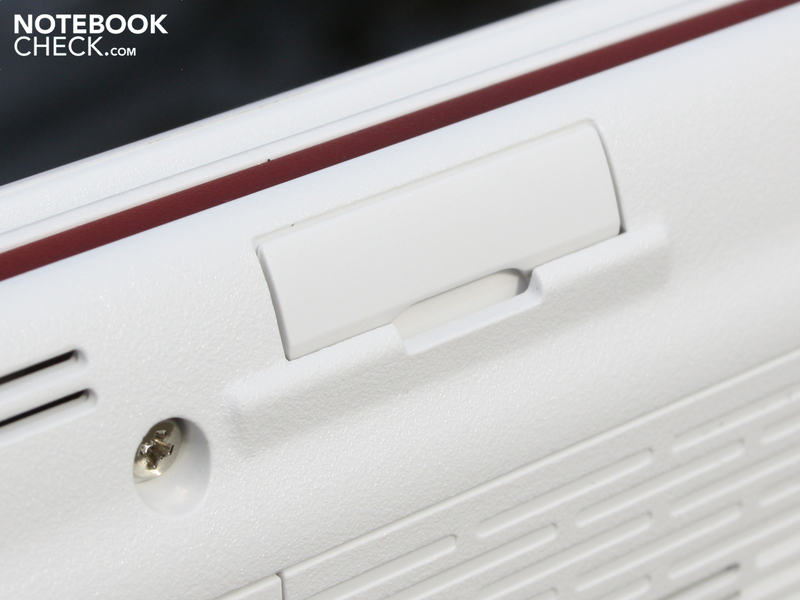 A matt, bordeaux-red stripe around the base unit gives the netbook a slightly feminine appearance. The surfaces are pleasingly matt to the touch, and don’t pick up fingerprints. Samsung has done without any glossy surfaces at all, a sensible choice making it more suitable for everyday situations, which are never exactly sterile. 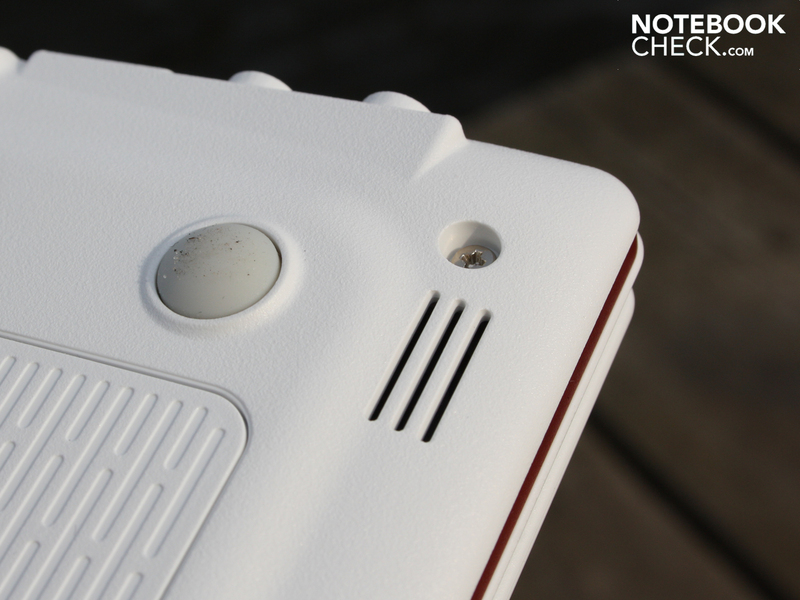 However, the matt white surfaces, particularly the non-slip underside and the screen edging, do tend to pick up dirt, and whereas smooth surfaces can simply be wiped clean again, the dirt will sit more stubbornly on the N145’s surfaces. The netbook’s ‘Duracase’ shell seems impressively robust. The lid is unusually rigid. It can only be made to flex by applying considerable force. The underside is not quite as perfect. 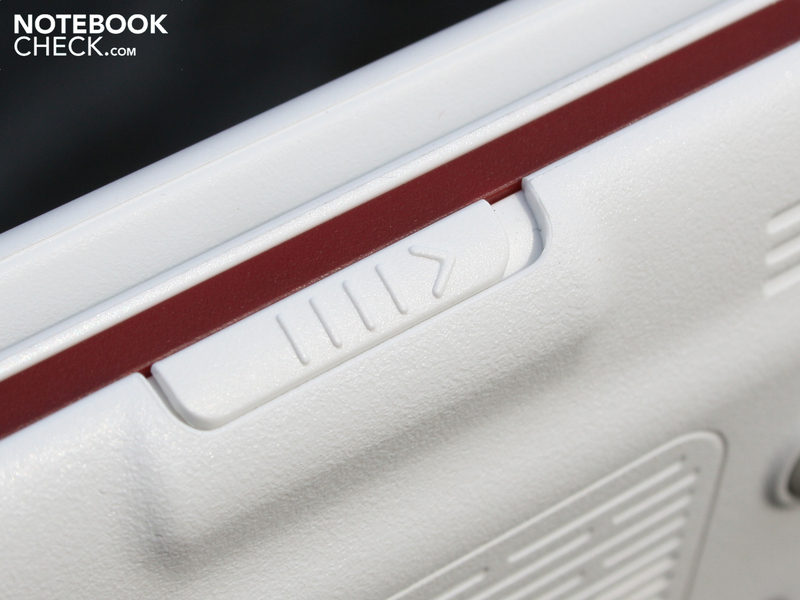 The cross-hatched surfaces of the RAM access panel and the air intake vent can be made to flex quite noticeably. 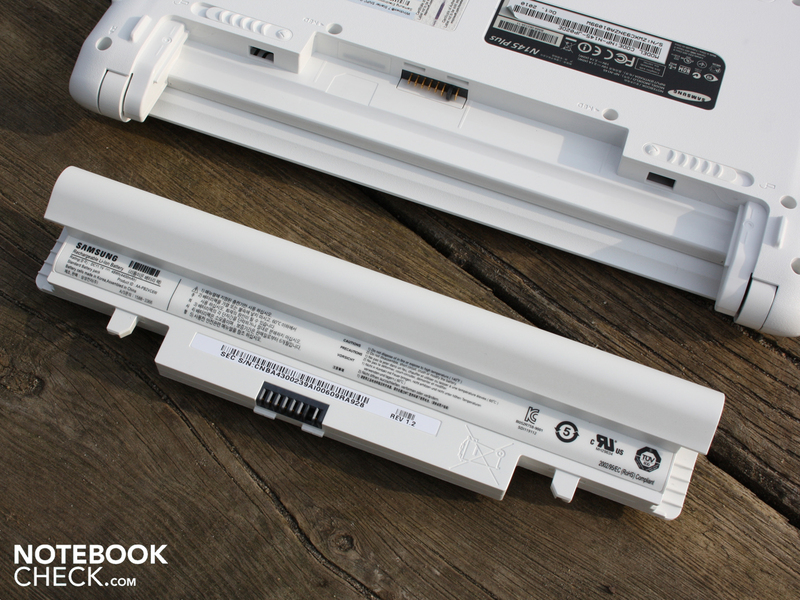 The battery latches tightly into place in the base unit, protruding out from it underneath. The hinges’ mechanical properties are very good; they move easily but are very firmly mounted. We needed both hands to open the netbook, as the initial resistance is very large. After that the lid can be moved easily with one hand. A meagre selection of ports, normal for a netbook. 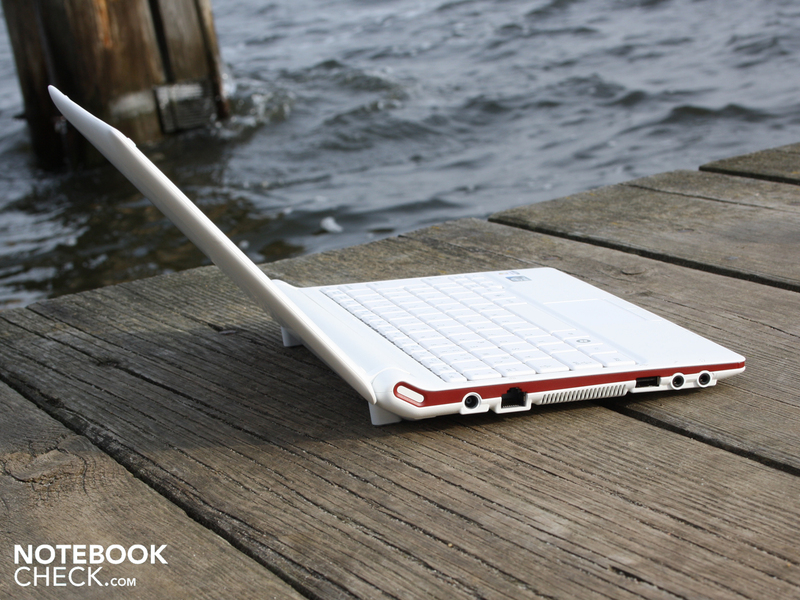 The selection of ports is the usual light fare offered by netbooks. On the left, you can plug in your network cable; the same side has a USB port and the headphone and microphone ports positioned near the front. 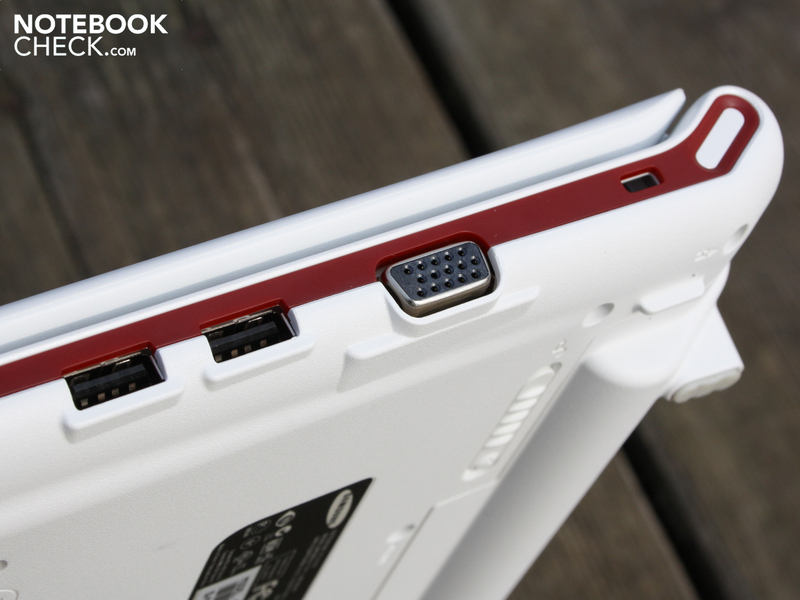 The USB ports do not come with the charging function which is now seen on many Samsung netbooks and notebooks. 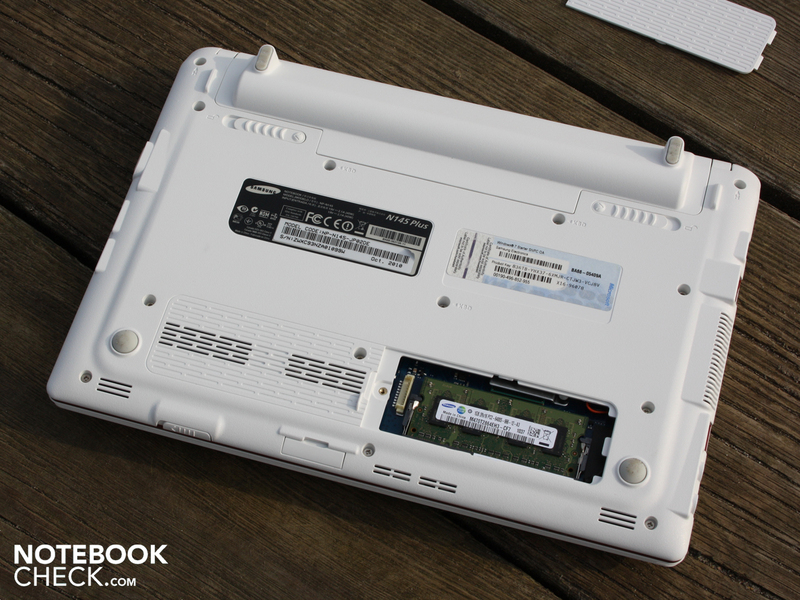 The right-hand side of the netbook houses a VGA port and two USB ports; there is a card reader below the front edge of the machine. 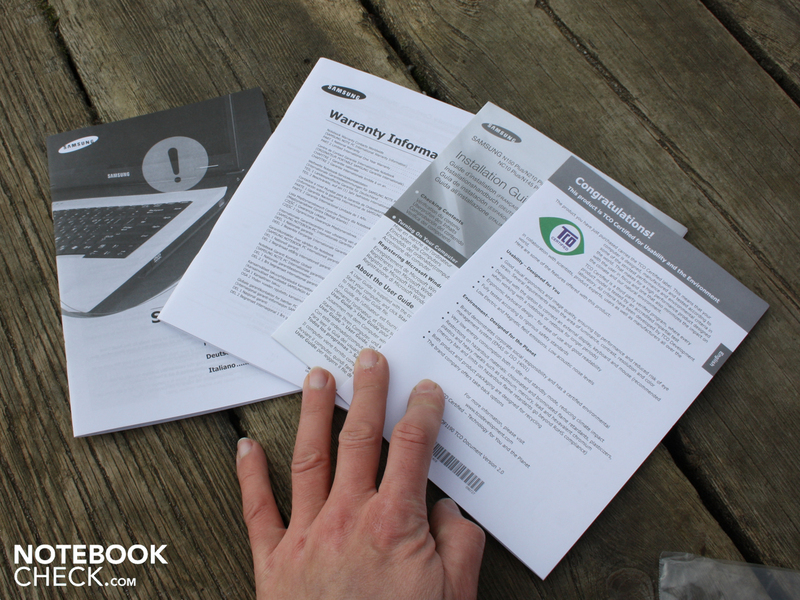 The Samsung tools, collected together in the Samsung Support Center, are worth a mention. As well as a tool for burning recovery DVDs (using an external USB burner), you can limit the battery charge to 80% using Battery Life Extender. This will prolong the life of the battery, because recharging is bad for it, on an electrochemical level. If your N145 is plugged into mains power for the majority of the time, you should definitely activate this function. 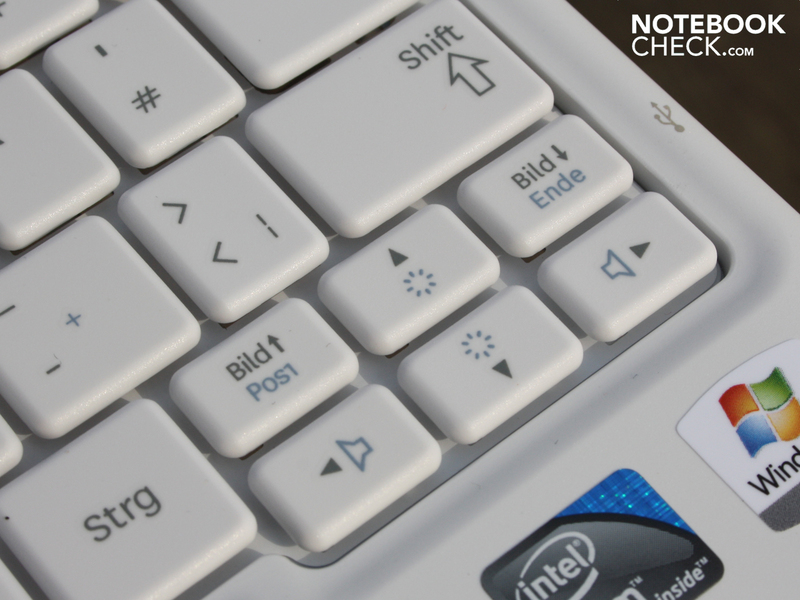 The keys have moderate travel, good tactile feedback and a soft impact at the end of the keystroke. The keyboard surface does not flex at any point. The keys are packed closely together, and the arrow keys as well as the Page Up/Down and the Ü and Ä keys are smaller than usual because of the lack of space. But there have to be compromises when the available space is so small. The multi-touch pad can be used in several different ways. You can scroll using two fingers, or in the classic style using the (unmarked) horizontal and vertical scrollbars. The surface of the pad is sensitive right up to its edges, and is as matt as the palm rest. Your finger glides across the surface with little resistance and the cursor responds accurately. The pad is firm, like the whole of the palm rest, and does not flex under pressure. 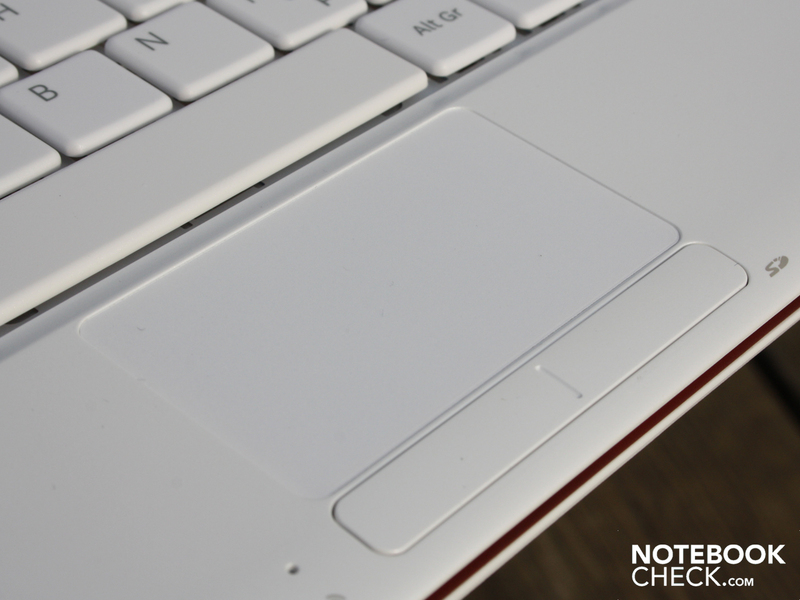 The tiny touchpad buttons unfortunately do not depress very far, but they do click nice and quietly. The 10.1-inch screen’s basic resolution of 1,024 x 600 is absolutely standard for netbooks. 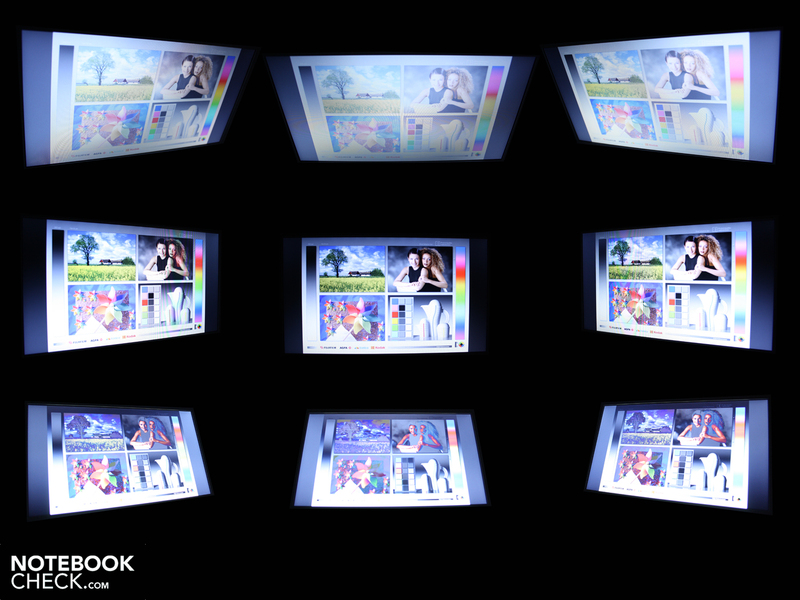 If you want to see more on-screen so you can scroll less, Samsung has a solution for you. The native resolution can be artificially increased (interpolated) to 1,152 x 864 or alternatively 1,024 x 768. The picture that results is not pretty and somewhat distorted, but you could now fit the whole of the notebookcheck home page on your screen. Along with an average brightness of 223 cd/m², we measured a low contrast ratio of only 115:1. 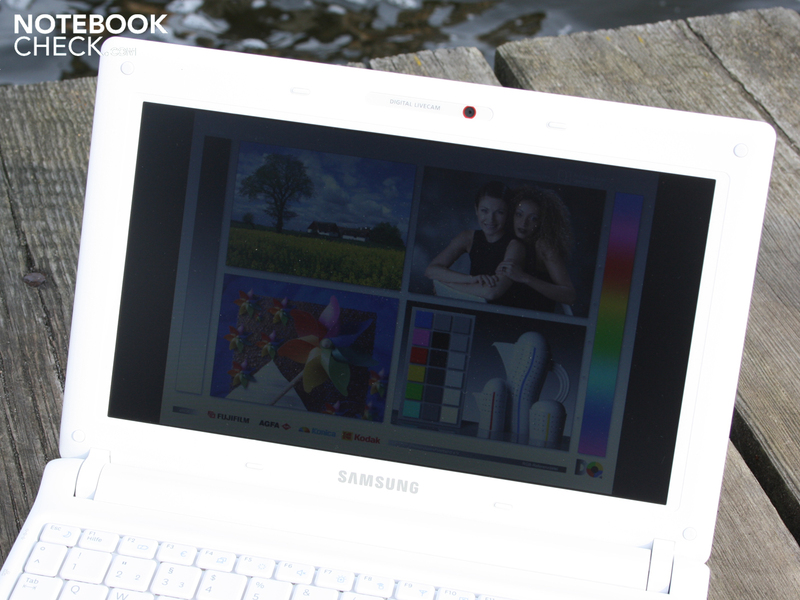 Almost every netbook comes with low contrast like this. It makes the colours appear rather pale and with less subtlety. The colour space, as you would expect, is a long way removed from what a professional would want. But no professional would be using a netbook; covering sRGB(t) and AdobeRGB(t) is essential for them. The reasonable brightness of 223 cd/m² means the picture is acceptable even in sunlight. The screen’s matt finish also allows you to surf the web without being bothered by reflections. A brightness of 300 cd/m² would be the perfect figure, and would provide a clear picture if used in the park on a sunny day. At least being on battery power does not restrict the brightness. 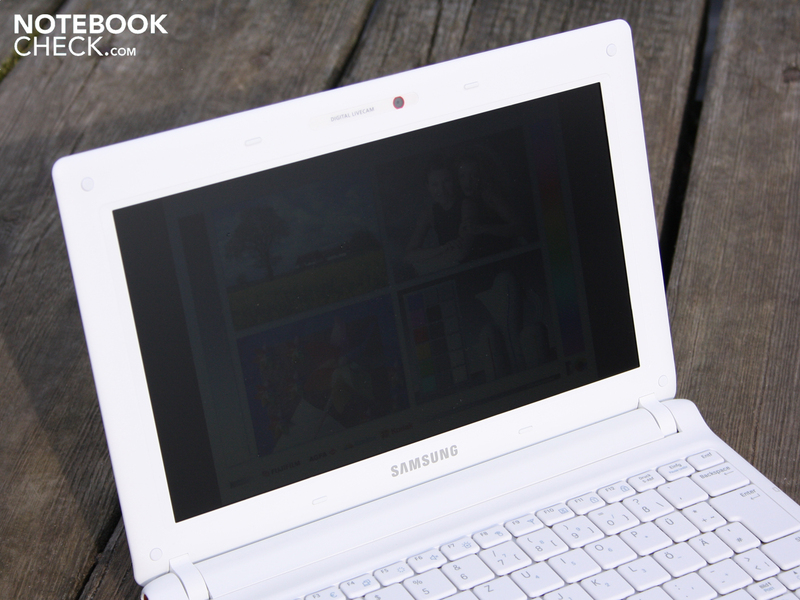 The Samsung netbook’s viewing angles are good along the horizontal axis. Text is still readable up to around 60 degrees, and colours do not invert. But vertically the eye of the beholder can only deviate by 20 degrees before the picture darkens substantially. At 45 degrees we saw the colours invert massively (ghost images). 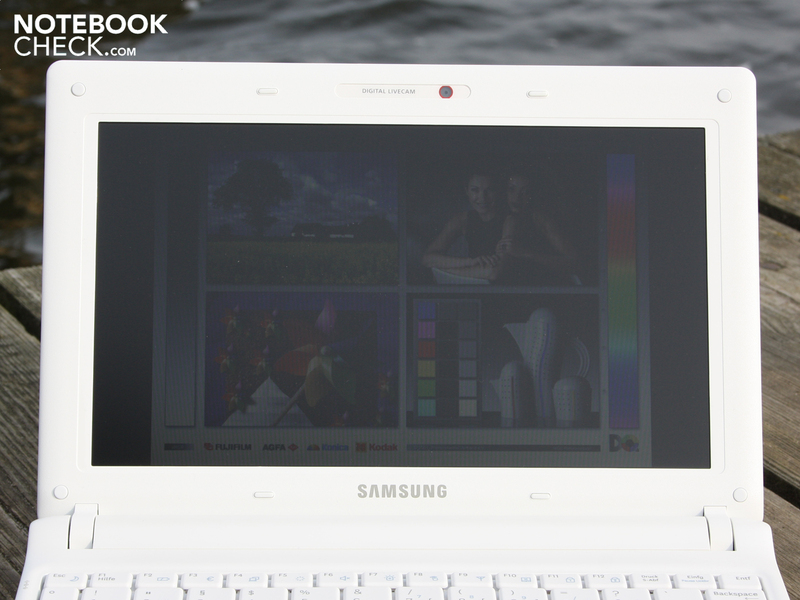 The Samsung N145 is based on the Intel Atom N450 processor (1.66 GHz, Pine Trail) with integrated GMA 3150 graphics. The processing speed may be low, but with the help of Intel’s Hyperthreading technology the single-core processor can handle a multi-tasking OS like the Windows 7 Starter system which is pre-installed. 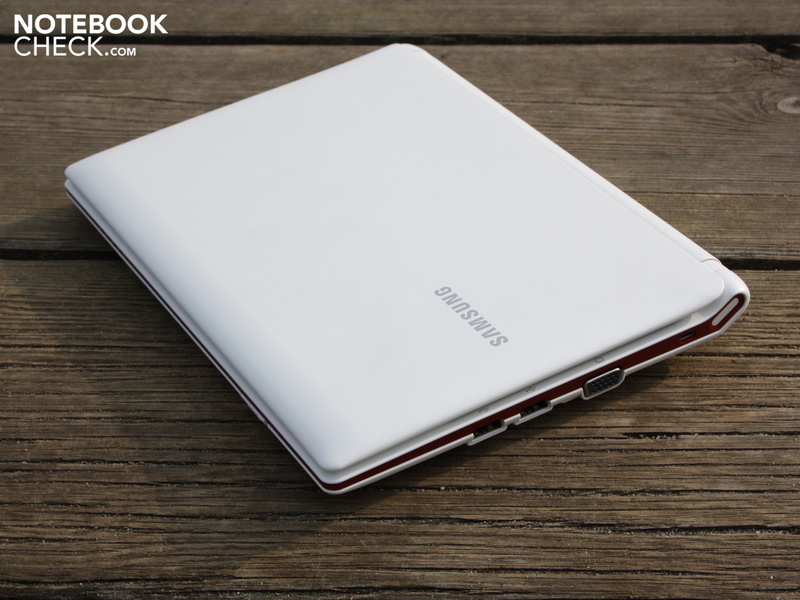 The processor is supported by 1,024 MB of DDR2 RAM as well as a 160 GB hard drive by Samsung (HM160HI). The PCMark Vantage benchmark determines system performance, taking all the system’s components into account such as the HDD, CPU, GPU, and RAM. The N145 manages to score 1,223 PCMark Vantage points. 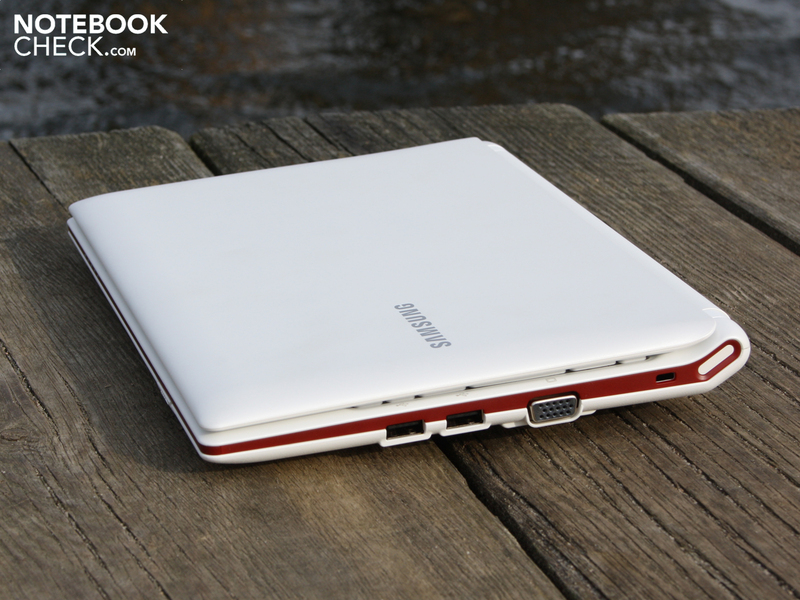 Compared to a recent Atom N550 netbook configuration, that is very litttle. 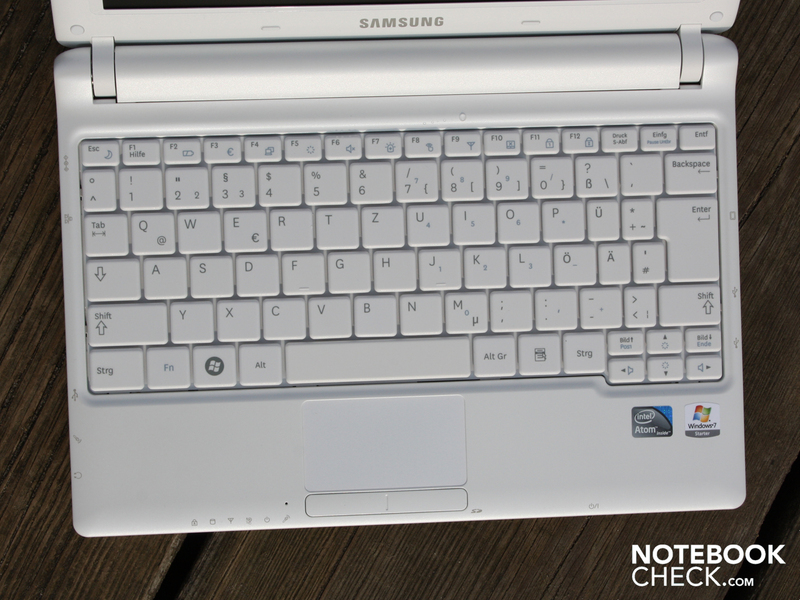 A Samsung NF210 scores 1,640 points. The application performance running Windows 7 Starter does not feel particularly fast. Even in high-performance mode and plugged into mains power, folders, files or new programs open with a significant delay. The system is at its slowest when programs are running simultaneously. Want to play music, write emails and have five tabs open on your browser? Better think again. The hard drive (model HM160HI) has a capacity of only 160 GB and achieved a very low data transfer rate in the HD Tune benchmark. A rate of 52 MB/s in the sequential read test is behind the times. The Crystal Disk Mark test indicates the same thing, giving 65 MB/s in the sequential reading and writing (another test routine). The HDD is not audible even when the read and write heads are active. It may not be fast, but it is quiet and cool. 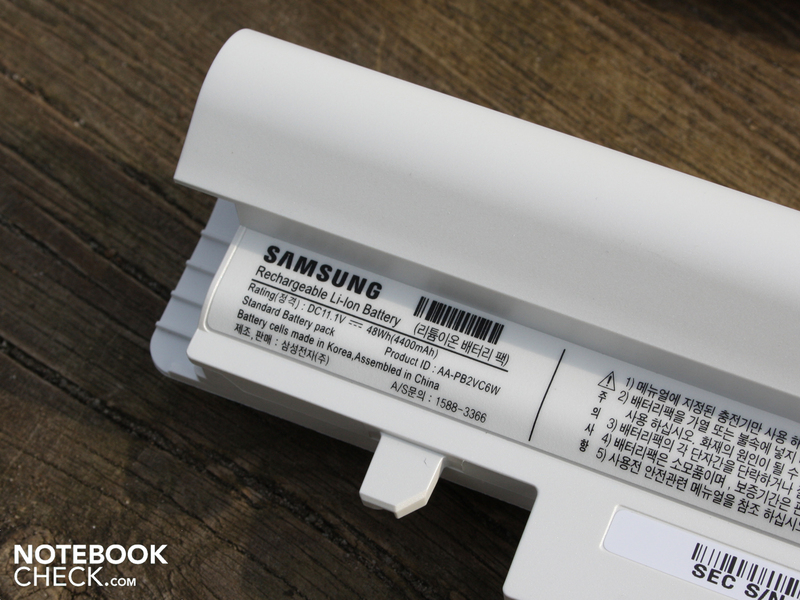 The Samsung N145 follows this principle at all times, whether running in idle or at full load. It barely makes a sound. Not even when the N450 processor is working flat out (stress test). The fan is turning constantly either in normal or speed mode (Fn + F8), but the 31.3 dB(A) it produces is practically inaudible. When the Samsung ‘silent mode’ is activated, the fan shuts off completely. Now all you can hear is the gentle background murmur of the HDD at 30.3 dB(A), if you listen carefully. In silent mode the fan will only come back on if the processor is put under stress or if the processor temperature gets too high for other reasons. In Samsung speed mode or normal mode (Prime95 or 3DMark06) the small cooling system is brought up to the aforementioned maximum of 31.3 dB(A). That is only 1 dB(A) above the background noise level of the room. 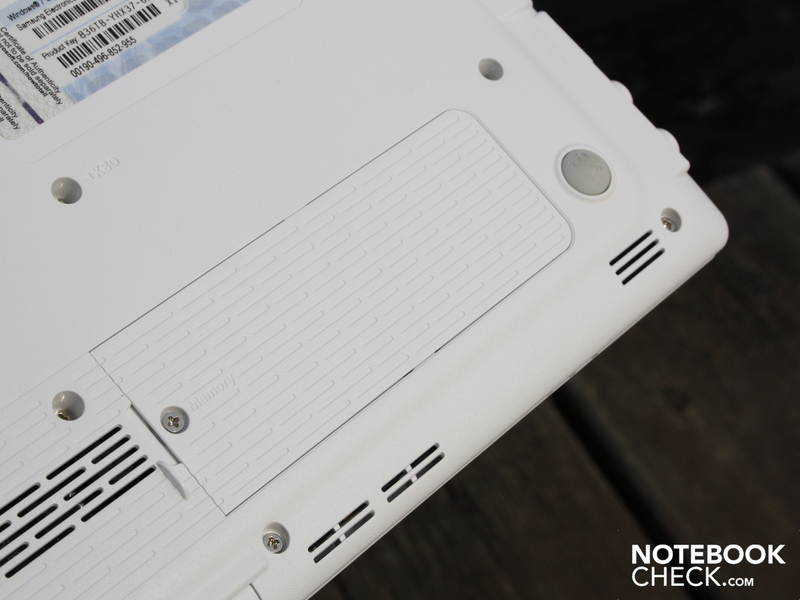 The netbook’s temperature gain stays low in every mode of operation (idle, stress), with the idle temperatures even higher than the stress ones. The reason for this is that the idle measurement was taken in silent mode. In this mode the fan is deactivated and the components’ waste heat (RAM, hard drive, CPU, motherboard) builds up. The temperature graphic shows red areas of up to 37 degrees. With a heavy load on the CPU using the Prime95 test, we measured a maximum of 32 degrees on the left side of the keyboard. The average temperature on the underside was only 31 degrees Celsius during the stress test. In silent mode in idle the average here was 34 degrees. (+) The average temperature for the upper side under maximal load is 27.9 °C / 82 F, compared to the average of 29.8 °C / 86 F for the devices in the class Netbook. (+) In idle usage, the average temperature for the upper side is 31 °C / 88 F, compared to the device average of 29.8 °C / 86 F.
The N145’s stereo speakers are positioned under the palm rest and direct their sound towards the table top, where it is reflected. The sound is too heavy on the high-tones. Discerning listeners will quickly reach for their headphones because of this unbalanced sound. But at higher volumes the little speaker membranes still manage to produce the sound without distortions. The 3.5 mm audio port provides a clean sound output, which was free of any unwanted noise during our basic sound check. 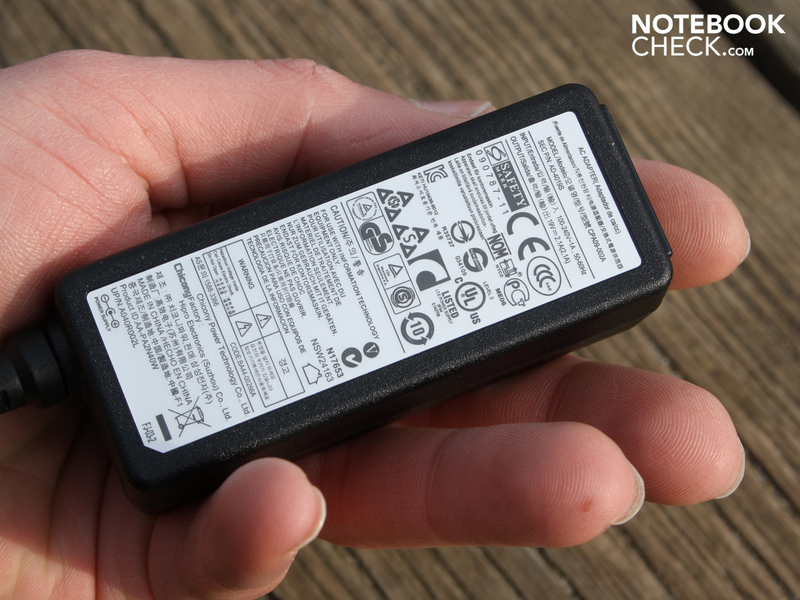 Buyers of netbooks, even cheap ones, are spoilt these days with battery life approaching that of some smartphones. Samsung has really pushed out the boat and offers excellent battery run times. Even when the N450 processor was continually under stress (Battery Eater Classic test), with the wireless modules on and the screen brightness on maximum, we could not get the netbook to last for less than four hours (4 hours 20 minutes). Our test using wireless internet surfing gives a result very close to the real everyday battery life. The battery only gave up after 6 hours. The LED screen was on the medium setting of 100 cd/m² during this test. We also tested the film playback battery life using a low-resolution AVI film. The lights went out only after 5 hours 47 minutes. When all possible energy-saving measures are activated, the N145 can even reach 10:14 hours. During these 614 minutes the netbook was turned on but inactive, with all its wireless modules turned off and the lowest screen brightness selected (Battery Eater Reader’s test). With such long battery life, the energy consumption has to be low. In idle, standby and when turned off we took very small energy readings. Our professional multimeter could only measure 0.5 Watts (standby) and 0.05 Watts (off). The low energy usage in idle of 6.9 Watts confirms the good idle battery life. A processor stress test could only bring the total energy consumption up to 13 Watts. During these energy readings the battery was not inserted. 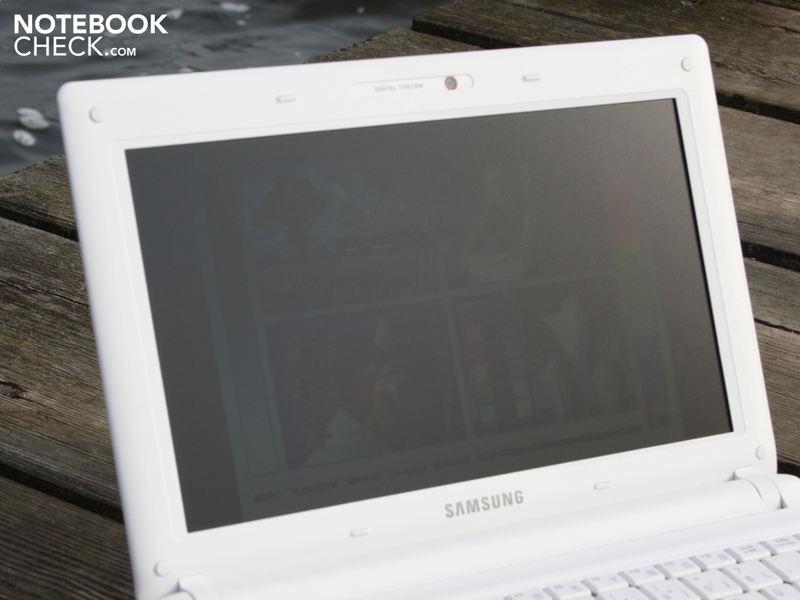 The Samsung N145-JP02DE offers exactly what many netbook users want, starting at 235 Euro. The robust case, very good lid hinges, good input devices and low sound levels are all very commendable. The matt WSVGA screen (which can be scaled up to 1,152 x 864 pixels) is sufficiently bright, and the netbook’s battery life of at least six hours is very long. The N145 is a good match for its price. 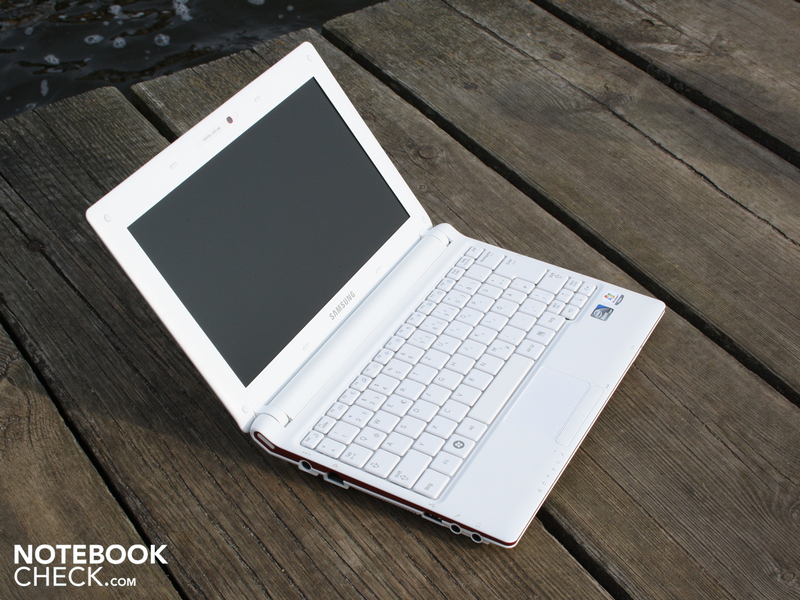 Buyers looking for a miniature mobile companion won’t go far wrong with this netbook. The only thing that buyers shouldn’t expect is speed and fluidity when multitasking. The single-core Atom N450 thinks very slowly and the small 160 GB hard drive with its low transfer rates could reasonably be described as a lame duck. 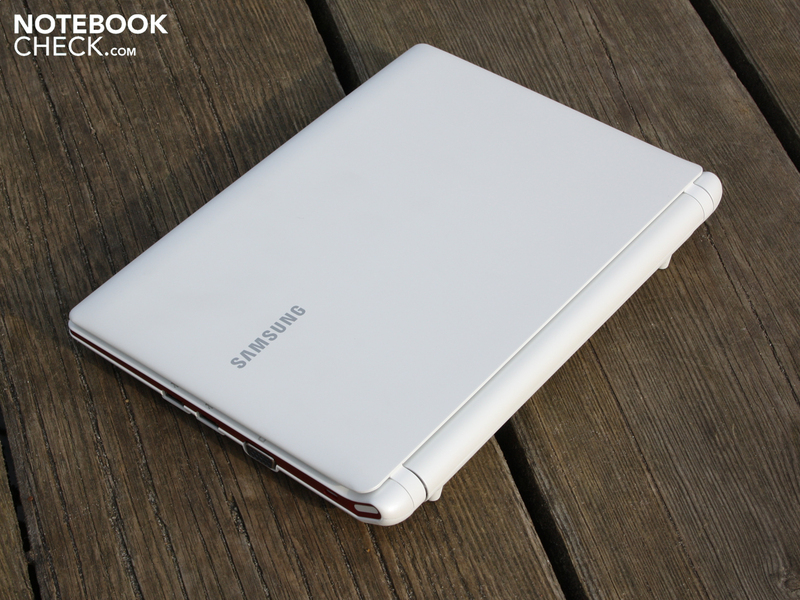 The Samsung N145, just one netbook among many? The white plastic of the case is matt and looks pretty. Unfortunately the screen edging and base unit seem to magically attract stubborn smudges of dirt. The palm rest and lid are smooth and therefore easier to clean (can be wiped). The power switch is located on the front edge. The card reader, also on the front edge, has a plastic cover. Nothing but the basics when it comes to the ports: USB, audio, LAN and VGA. The base plate on the underside is fairly easy to remove once you take out a lot of screws (access to HDD). The black mains adaptor doesn’t quite fit in with the netbook’s white look. But it does weigh only 173 g.
Battery life is as long as six hours (WLAN use) with the 48 Wh battery. The battery sticks out from the bottom of the base unit, but has feet. which may appeal particularly to women. is relatively light at 1.2 kg including battery. Of course at this kind of price it only comes with an Atom N450 and 1 GB of DDR2 RAM, along with Windows 7 Starter. Commendable: the 10-inch screen has a matt finish. The screen is also very bright, so it’s possible to use it outdoors. The user has to burn his own recovery disks for Windows 7 Starter using the Recovery Tool and for example a USB DVD burner. The interpolated resolution gives you more of an overview on your screen, without the need for an HD-ready display. How much bang for your buck you can get with netbooks these days, and with the OS included too. The Asus Eee PC R101 with vibrant screen; Samsung NF210-HZ1 with Intel Atom N550 and a 3G module; Acer Aspire One D255 with N550; Samsung NF310 with matt HD-ready screen.